When I'm not in the mood for fishing these days I don't go. Whether the resounding four swim full day blank on the second day of the year deterred me, or the never ending rain (on days when I had spare time), is hard to say. At least I saw a pike on that session. I'd stuck a lure rod in the quiver and one lure. A weighted Squirrely Burt is as safe a bet as any in my book when it comes to picking a banker lure, so that was what I packed. Indeed a small jack showed up as a late and lazy follower. Nothing touched the deadbaits despite the conditions looking and feeling great. It wasn't until mid-morning today that the urge to fish washed over me again. Must have been the sun breaking through on a day with little wind. This time the Burt was ignored. I'd given it a try in a couple of swims before breaking out the deadbait rods in another. Two cups of tea after settling in I needed to empty the bladder. No sooner had I zipped up than the sounder in my pocket began to burble. With the sensitivity turned up on the Delkims every run sounds like the fish is rocket powered. When I got to the rod the spool was turning quite slowly. Pick the rod up, tighten down. Wind the bait in. I never felt the fish. Tiny teeth marks suggested it was a little nipper. The bait was dropped back in the same marginal spot and the other bait given a twitch. Half an hour later and the margin float fell flat before moving slowly and steadily to the left, turning out then stopping. I'd crept to the rod as the float was less than a rod length from the tip eye. The float dithered and I wound down again. This time I felt something before winding the bait back in yet again. There was a slice mark in the lamprey, but I reckon that was caused by me pulling the bait through the jack's teeth. the weight I felt was minimal. I'd hardly sat down when the float fell flat once more. This time the pike had dropped the bait. Time for a move. Followed an hour later by a final move. Rain had been predicted for six o'clock by the interwebs. I was hopeful of getting away before it arrived with dark falling an hour before that. The interwebs got it wrong. The rain arrived fifteen minutes before packing up time. Thankfully it was no'but drizzle. enough to soak the landing net and brolly so they needed taking out of the quiver on my return home. Given my dismal failure of late it seems a bit daft to describe the rig I've been using for my roving. But it's not the rig's fault I've been missing takes it's mine. I first mentioned the set up a couple of winters back but don't think I illustrated it. The following photos should be pretty self-explanatory. This first pic shows it rigged to float leger a deadbait with a semi fixed lead, which is how I use it most of the time. You can use braid stops or tie stop knots. The choice is yours. 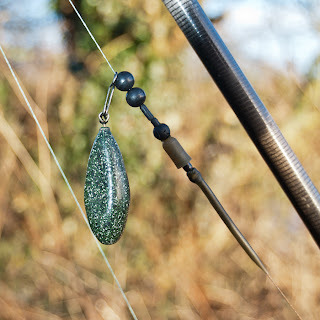 The stop below the float is to prevent the float tangling with the lead on the cast. It also stops the float and beads sliding off the line when changing traces - I hate attaching traces to the line with snap links as I find they always tangle. My floats are simple sticks of one inch balsa dowel, shaped, painted and varnished. I find 'dumpier' floats easier to see than slim pencils and reckon they hold up better in a flow or a chop. As the floats are fished overdepth they rarely get pulled under when a pike takes the bait, so resistance isn't an issue. The fish will be towing an ounce and a half of lead around anyway! The swivel in the base is fitted on a split pin pushed into the balsa and epoxied in place. Lead and float are clipped on using the Korum links which can be removed from the line. This enables the rig to be used as either a semi-fixed leger by removing the float, or a running leger (as in the pic below) by removing the float and repositioning the clip the lead is attached to. If you think the lead might snag up then insert a silicone tube sleeved weak link between it and the clip, or maybe a paperclip. To create a float paternoster rig remove the lead and clip, then tie a weak paternoster link between the top treble and the lead. 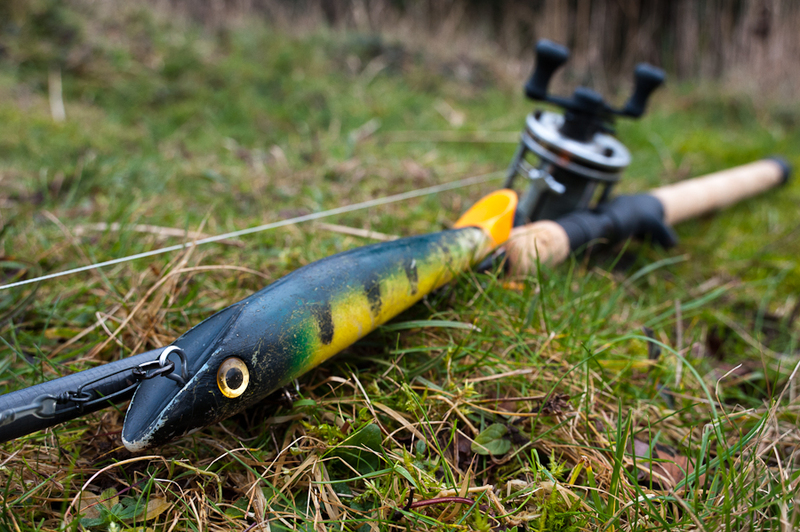 Want to float fish an untethered bait? Take the float leger and clip on a lighter bomb. I've even made a mini-drifter to use with the rig. More of which if I manage to get a take on it. It does drift though! 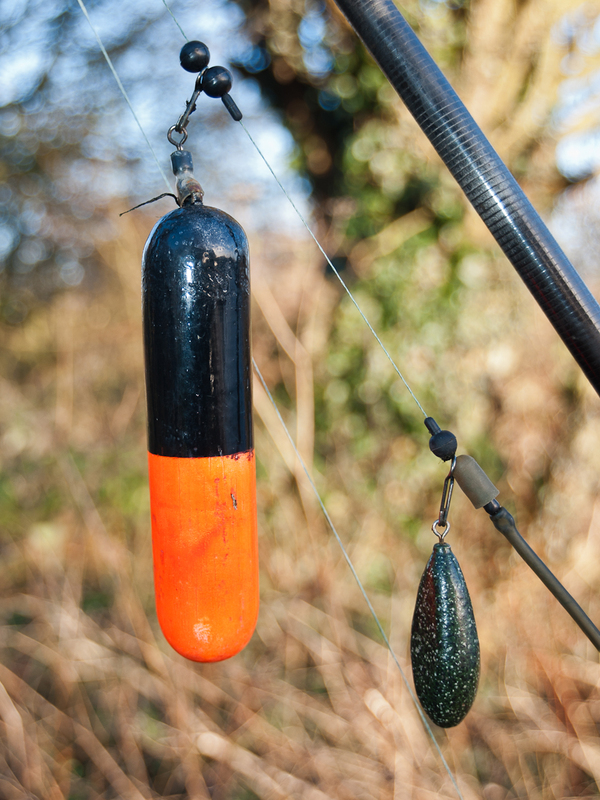 Fancy wobbling a deadbait? Take the lead and float off. For drains, canals, and small stillwaters this set up has been pretty good to me so far. If the interwebs are right I might get to give it another go on Thursday. Should I be in the mood.